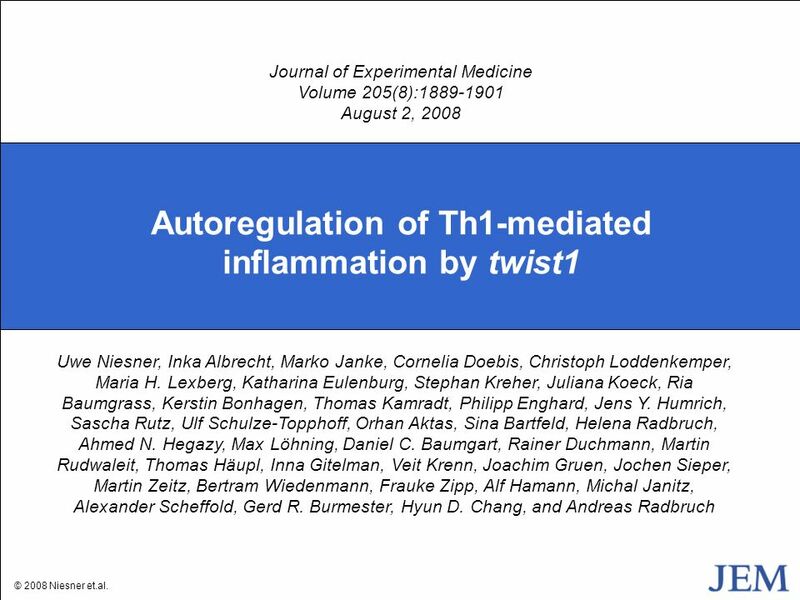 Journal of Experimental Medicine Volume 205(8): August 2, 2008 Autoregulation of Th1-mediated inflammation by twist1 Uwe Niesner, Inka Albrecht, Marko Janke, Cornelia Doebis, Christoph Loddenkemper, Maria H. Lexberg, Katharina Eulenburg, Stephan Kreher, Juliana Koeck, Ria Baumgrass, Kerstin Bonhagen, Thomas Kamradt, Philipp Enghard, Jens Y. Humrich, Sascha Rutz, Ulf Schulze-Topphoff, Orhan Aktas, Sina Bartfeld, Helena Radbruch, Ahmed N. Hegazy, Max Löhning, Daniel C. Baumgart, Rainer Duchmann, Martin Rudwaleit, Thomas Häupl, Inna Gitelman, Veit Krenn, Joachim Gruen, Jochen Sieper, Martin Zeitz, Bertram Wiedenmann, Frauke Zipp, Alf Hamann, Michal Janitz, Alexander Scheffold, Gerd R. Burmester, Hyun D. Chang, and Andreas Radbruch © 2008 Niesner et.al. 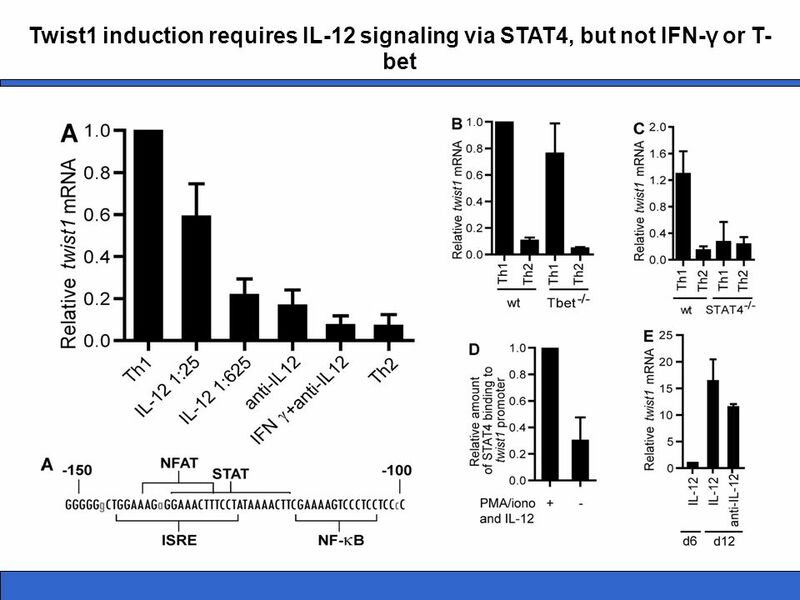 Twist1 induction requires IL-12 signaling via STAT4, but not IFN-γ or T- bet. (A) CD62Lhi DO11.10 Th cells were stimulated for 5 d under Th1- polarizing conditions (5 ng/ml IL-12, anti-IL4), reduced IL-12 (1/25:200 pg/ml; 1/625:8 pg/ml, anti-IL4), in the absence of IL-12 (anti–IL-12, anti-IL4), in the presence of IFN-γ (10 ng/ml IFN-γ, anti- IL-12, anti-IL-4), or under Th2-polarizing conditions. Twist1 mRNA in Th cells activated for 3 h with PMA/ionomycin and IL-2 was quantified by RT-PCR. 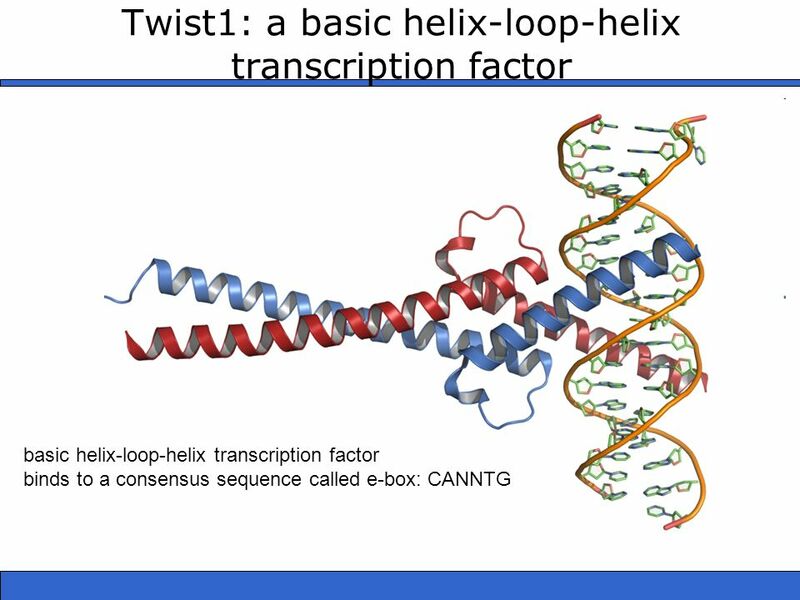 The amount of twist1 transcripts induced under Th1- polarizing conditions was set to 1. Data are presented as the mean ± the SD of at least three experiments. (B) CD62Lhi Th cells of T-bet−/− mice and syngenic BALB/c mice were stimulated with anti-CD3/CD28 and BALB/c APCs under Th1 (IL-12 and IFN-γ), or under Th2- polarizing conditions for 6 d. Data represent the mean ± the SD of three experiments. 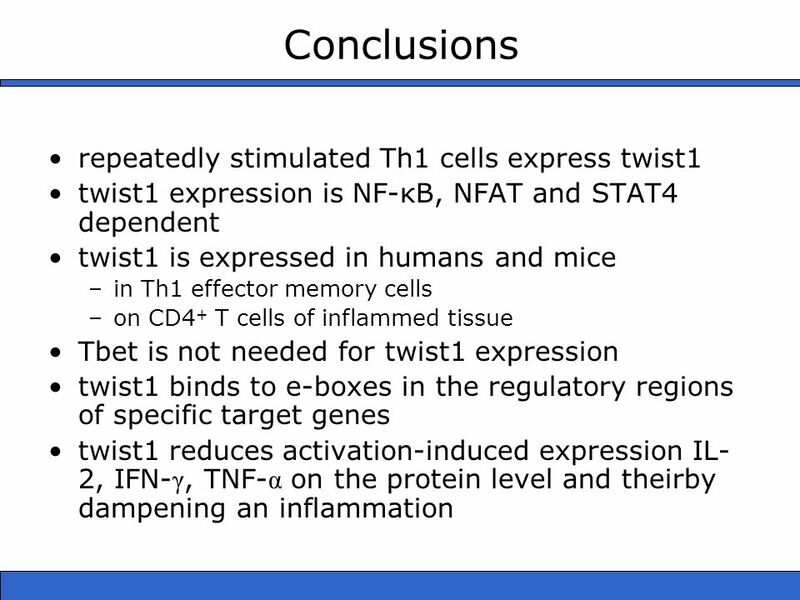 The amount of twist1 transcripts induced in activated wt Th1 cells was set to 1. (C) CD4+ cells of STAT4−/− and syngenic BALB/c mice were stimulated with anti-CD3/CD28, and BALB/c APCs under Th1 (IL-12 and IFN-γ) or under Th2-polarizing conditions for 5 d. Data represent the mean ± SD (four mice each). (D) The binding of STAT4 to the proximal promoter of twist1 was analyzed by ChIP. 6-d-old Th1 cells were restimulated with PMA/ionomycin in the presence of 10 ng/ml IL-12 for 3 h or left unstimulated. The immunoprecipitated DNA was quantified by RT- PCR using primers specific for the proximal twist1 promoter. The precipitated DNA was normalized to the amount of input DNA. The amount of twist1 transcripts precipitated in the presence of IL-12 was set to 1. Data represent the mean ± SD of three experiments. (E) Naive DO11.10 Th cells were stimulated for 5 d with APCs and OVA under Th1-polarizing conditions. 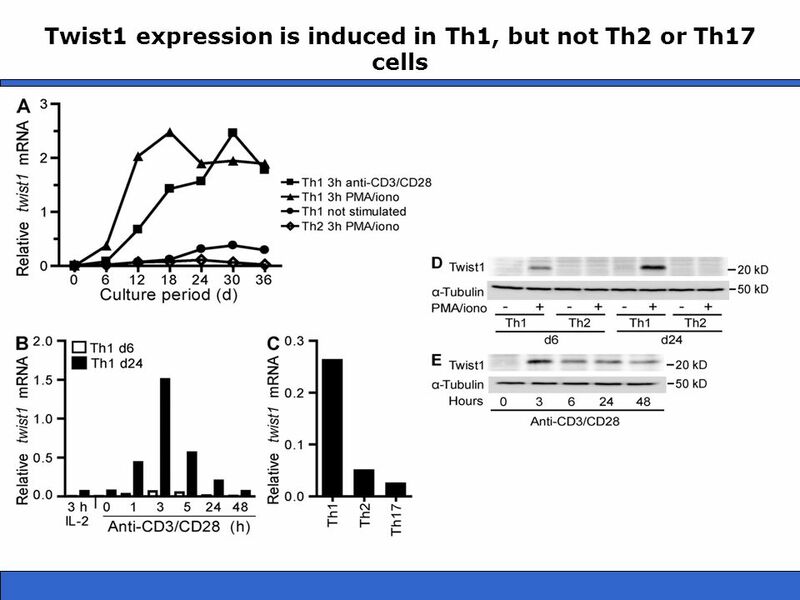 Cells were restimulated under the same conditions (Th1), or in the presence of anti–IL-12. Twist1 transcripts were quantified on d 11. The amount of twist1 mRNA on d 5 was set to 1. Data represent mean ± SD of three experiments. 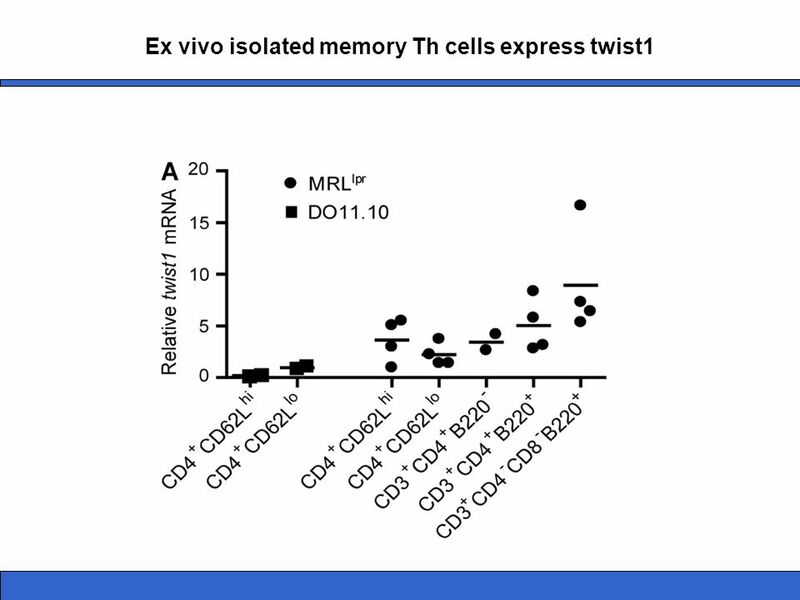 Ex vivo isolated memory Th cells express twist1. Cells were sorted by flow cytometry and restimulated for 3 h with PMA/ionomycin (A–C). (A) Cells were isolated from the spleen and lymph nodes of 8–12-wk- old DO11.10 mice (squares, each representing a pool of 15 individual mice) and the pooled inguinal and mesenteric lymph nodes of 4–6- mo-old nephritic MRL/lpr mice (circles, 1–2 mice each). Of note: 90% of the CD4+CD62Lhi cells in MRL/lpr mice represented activated (CD44+) cells (not depicted). (B) Twist1 mRNA in peripheral human Th lymphocytes. The mean expression of twist1 mRNA normalized to ubiquitin ligase H5 in total CD3+CD4+ cells was set to 1. Subpopulations were defined according to expression of the following surface markers: naive (CD4+CD45RA+CCR7+), CM (CD4+CD45RA−CCR7+), EM (CD4+CD45RA−CCR7−) with each data point representing one individual healthy donor. (C) Twist1 transcripts in CD3+CD4+ cells purified from patient material: blood (total peripheral CD3+CD4+ cells from healthy donors, see B), colon (noninflamed colon tissue), UC, and CD (endoscopic biopsies from UC and CD patients, respectively), RA, ReA, PsA, and AS (synovial fluid from rheumatoid arthritis, reactive arthritis, psoriatic arthritis, and ankylosing spondylitis patients, respectively) with each dot representing one individual patient. Mean twist1 mRNA expression is displayed from patients who were repeatedly sampled. 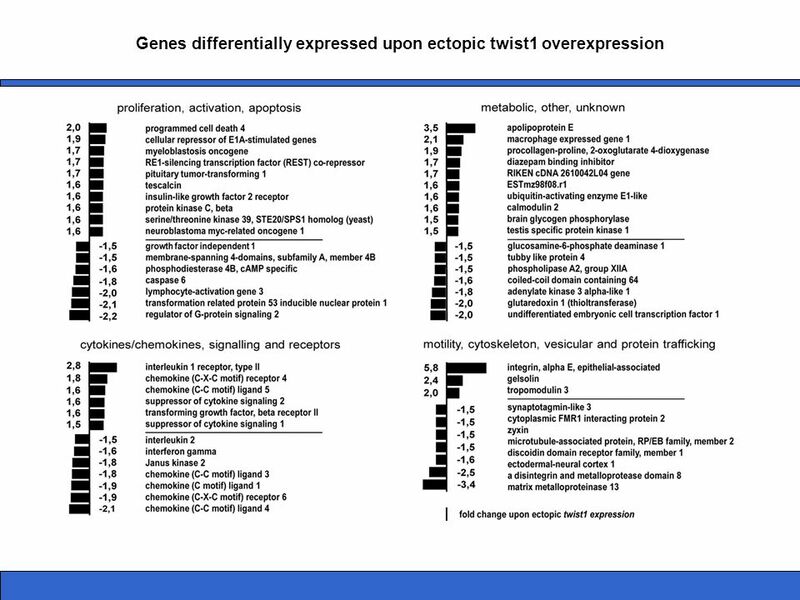 Genes differentially expressed upon ectopic twist1 overexpression. Splenic DO11.10 cells were activated in vitro with the cognate peptide OVA in the presence of 1 ng/ml IL-12 and 1 ng/ml IL- 2. On d 2, cells were infected with control retrovirus, or twist1- encoding virus. On d 5, cells were sorted according to expression of the viral marker gene gfp. Cells were restimulated for 4 h with PMA/ionomycin. The transcriptional profiles of duplicates of cultures were compared. 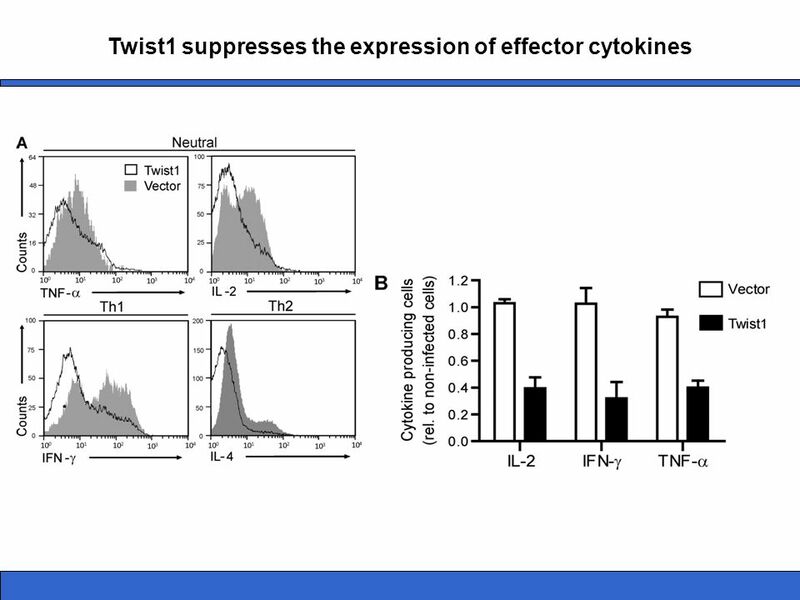 Twist1 suppresses the expression of effector cytokines. DO11.10 Th cells were stimulated for 5 d under Th1- or Th2-polarizing conditions or without addition of cytokines. On d 2, cells were infected with control virus or twist1-encoding virus. The cells were restimulated on d 6 and stained for intracellular cytokine expression. (A) Representative histograms of cytokine expression in Th cells ectopically expressing twist1 (black line) and control cells (gray filled). The cells displayed were gated for expression of CD4 and the viral marker gene gfp. (B) Frequencies of cytokine-expressing cells among infected, i.e., GFP+CD4+ T cells relative to the noninfected CD4+ cells. Cells had been stimulated without addition of cytokines and infected with control virus (open bars) or twist1-encoding virus (filled bars). Data represent the mean ± SD of four independent experiments. 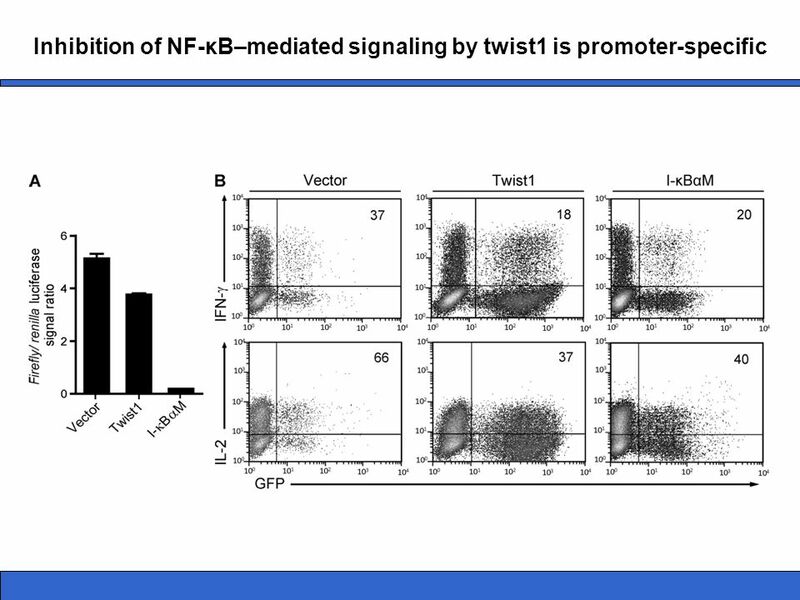 Inhibition of NF-κB–mediated signaling by twist1 is promoter-specific. DO11.10 Th cells were stimulated with OVA , APCs, and 1 ng/ml IL-12. On d 2, cells were infected with control virus, twist1, or I- κBαM-encoding virus. On d 3, cells were nucleoporated with a mixture of a plasmid encoding Renilla luciferase, and a firefly luciferase reporter construct, driven by a NF-κB–responsive promoter (4xκB-luc). (A) Cells were restimulated with PMA/ionomycin for 6 h, sorted according to expression of the viral marker gene gfp, and luciferase signals were quantified in duplicates (mean ± SD). (B) The very same Th1 cultures were restimulated on d 5 and stained for intracellular cytokine expression. Frequencies of cytokine-expressing cells among infected, i.e., GFP+CD4+ T cells, are displayed. Data are representative of two experiments. 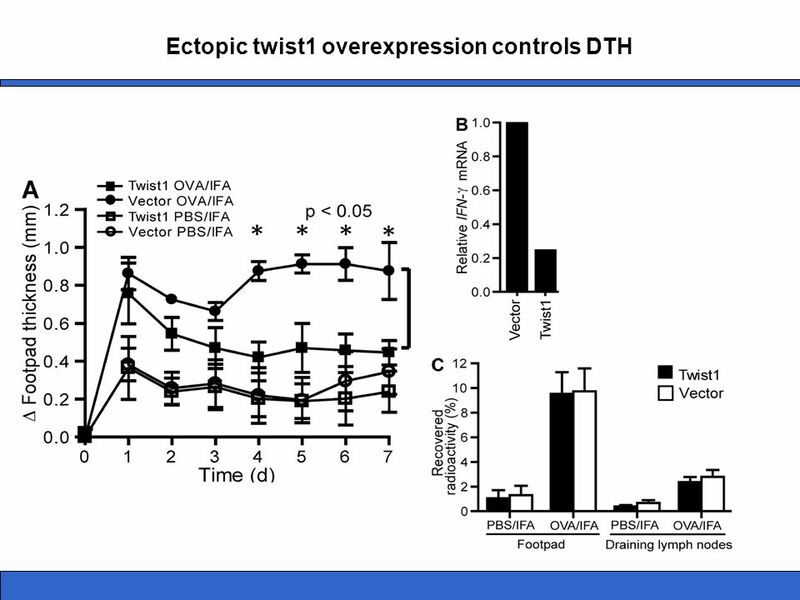 Ectopic twist1 overexpression controls DTH. (A) Naive DO11.10 Th cells were stimulated under Th1-polarizing conditions. On d 2, cells were infected with control virus (circles) or twist1-encoding virus (squares). On d 6, infected GFP+ cells were injected i.v. into BALB/c mice. The DTH response was induced by s.c. OVA /IFA injection into the left footpad (filled symbols), and Δ footpad thickness (mean ± SD; n = 4, Mann-Whitney test, nonparametric) was determined thereafter. Injection of PBS/IFA served as control (open symbols). (B) Ex vivo IFN-γ mRNA expression in transferred GFP+ Th1 cells 24 h after DTH induction isolated from the draining popliteal lymph node (left foot). (C) To monitor the migratory capacity of the transferred cell populations, infected GFP+ Th cells were radiolabeled and injected i.v. into BALB/c mice 1 d after induction of the DTH response. 24 h later radioactivity recovered from indicated tissues was determined using a γ-counter (mean ± SD; n = 4). 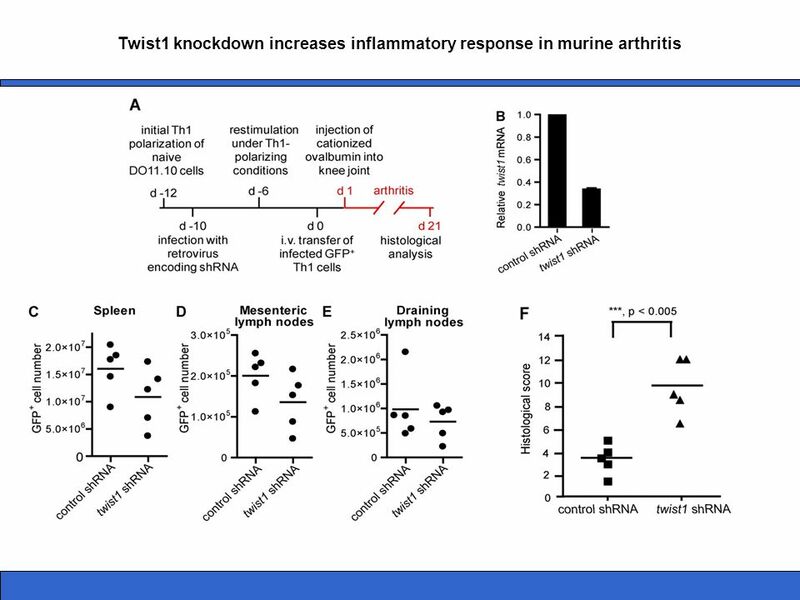 Twist1 knockdown increases inflammatory response in murine arthritis. (A) Experimental scheme. (B) Twist1 mRNA in 18-d-old Th1 expressing twist1-targeting shRNA or control shRNA restimulated with PMA/ionomycin. (C–E) Cell numbers of adoptively transferred GFP+ Th cells in spleen, mesenteric lymph nodes, and draining lymph nodes were analyzed on d 21 using FlowCount Beads. 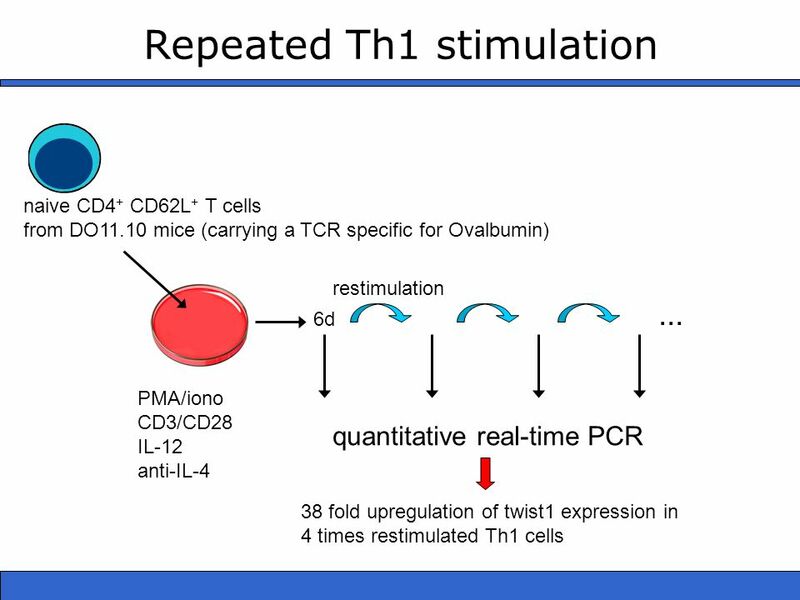 (F) Transfer of Th1 cells expressing a twist1-targeting shRNA leads to a significantly higher histological score in murine arthritis compared with control Th1 cells (d 21). Data are representative of two experiments. Download ppt "Autoregulation of Th1-mediated inflammation by twist1"
Cancer Immunoediting Integrating Immunity’s Roles in Cancer Suppression and Promotion Omer GULLULU. Pericarp of Mangosteen Inhibits Nuclear Factor κ B (NF- κ B) Activation and Reduces ICAM-1 and IL-6 in Atherosclerosis Department of Cardiology, Brawijaya. 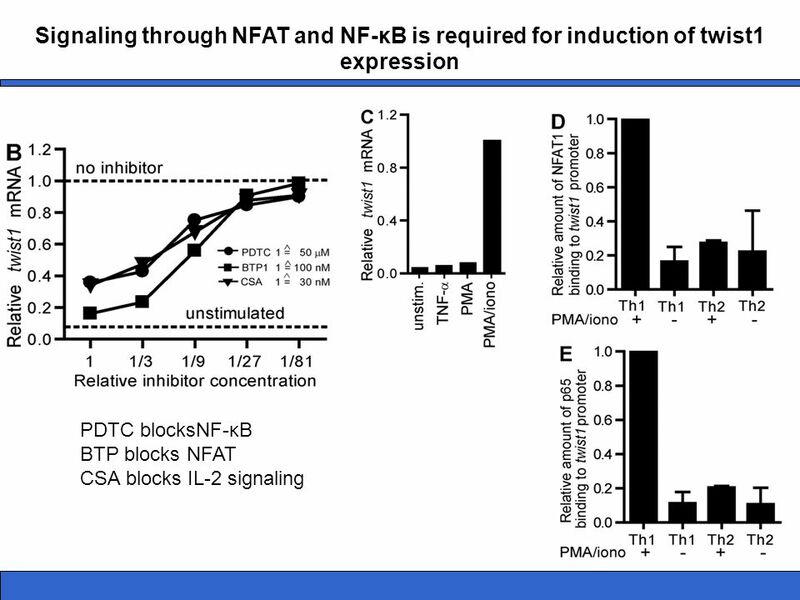 15dPGJ2 reduces NF-κB in peripheral blood mononuclear cells and reduces the production of the pro inflammatory cytokines IFN-γ and TNF-α in T helper cells. New York University -Derya Unutmaz, M.D. -Lina Kozaya Tempero Pharmaceuticals -Radha Ramesh -Alex Pellerin -Thaddeus Carlson, Ph.D. -Ivana Djuretic, Ph.D.
GEMS Journal Club 8/29/12 T cell polarization: Eyerich et al. NEJM 7/21/11. José Pedro Lopes Exhausted CD3 CD8 TCR TIM3 1B11 LAG3 Generated in chronic antigen- mediated TCR stimulation. 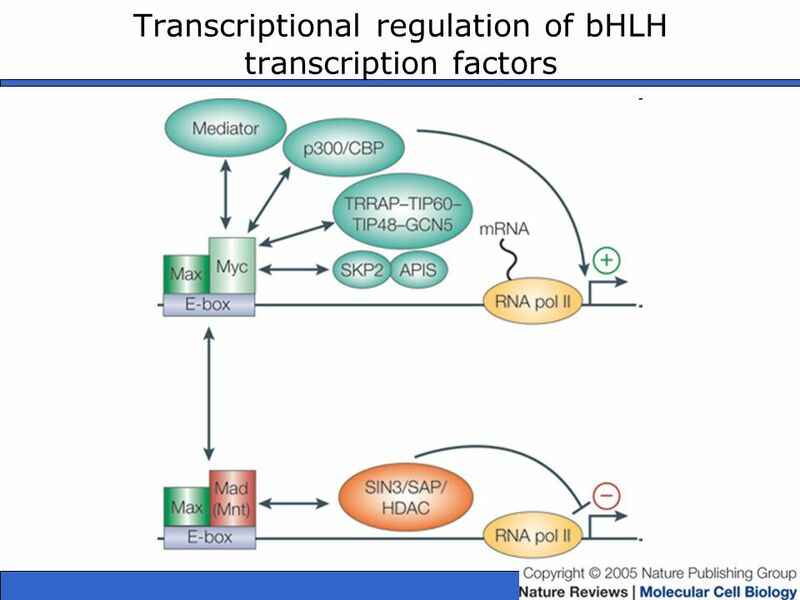 Express inhibitory receptors and lack effector. Opportunistic Bacterial Infections in Inflammatory Bowel Disease By: Christina Philips. The HMG-Co-A reductase inhibitor, atorvastatin, promotes a Th2 bias and reverses paralysis in central nervous system autoimmune disease Youssef, et. al. 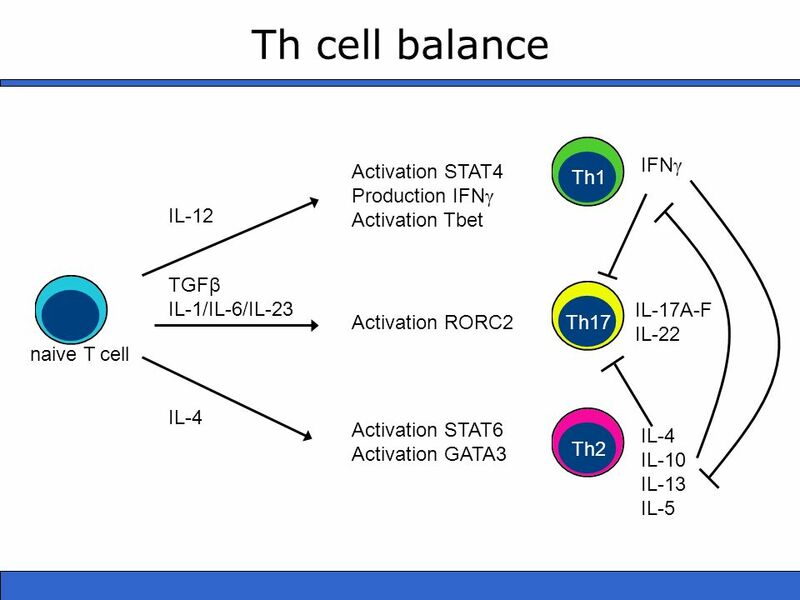 Th Cell Subsets Dale T. Umetsu, MD, PhD February 27, 2002 n The definition of the Th1/Th2 subsets. n Situations in which Th subsets important. n How do.